Follett 50CI425A-L Symphony Countertop Air Cooled Ice Maker and Water Dispenser - 50 lb. Follett: Innovative solutions, inspired by ice. Hi, my name is Ernie Tarof. I’m the national sales support manager for Follett’s health care division. In response to the heightened awareness of patient safety and infection control, Follett has produced this video to demonstrate the correct procedure for descaling, cleaning, and sanitizing Follett’s ice and water dispensers used in the healthcare industry. This video is not intended to replace the service manuals packed with the equipment, so be sure to review that information before starting any service procedure. The cleaning and sanitizing procedure should be performed by a trained maintenance technician, or by a Follett authorized service provider. Use only approved Follett cleaners and sanitizers. Be sure to wear rubber gloves and safety goggles or a face shield for protection when handling cleaner or sanitizer mixtures. The procedure should be performed at least every 6 months, more often if local environmental or water conditions dictate. As always, if your questions are not answered in this video or in the service manual, please call the technical service department toll free at 877-612-5086 for assistance. Technicians are available from 8 am to 8 pm eastern time, 7 days a week. Or visit our website anytime, at www.follettice.com for the most current information. Follett has designed its equipment to make it as easy as possible for you to perform the cleaning, descaling, and sanitizing. Our 12 series unit utilizes an integral ice maker, while our 25, 50, and 110 models leverage the ability to use a modular ice maker design for easy access and service ability. During this presentation we will be primarily looking at 2 of our dispensers, the 12CI countertop dispenser, and one of our newest dispensers, the 25CI countertop units. Although there may be some differences in component locations with other models, the procedure is the same. We will look at and point out some of the differences at the end of the demonstration. Be careful to follow the steps of the procedure in the order as described in the demonstration. Performing the steps out of order can negatively impact the effectiveness of the procedure. The semi-annual cleaning and sanitizing procedure is a 4-step process. The steps are: 1) cleaning and descaling the icemaker, evaporator, and other related parts. 2) Sanitizing the icemaker. 3) Cleaning the ice storage hopper and related components of the ice dispenser, and 4) sanitizing the ice storage hopper and related components. The cleaning, descaling, and sanitizing procedure should always include both the ice machine and the ice dispenser; always service the ice maker first, followed by the dispenser, never the other way around. If replacement parts are required, use only genuine Follett replacement parts or Follett approved substitutes. Items needed for the procedure include Follett SafeClean icemaker cleaner and Calgon IMS 2 icemaker sanitizer or Follett approved equivalents. If need be, contact Follett Technical Support for a list of equivalents. Also needed will be basic hand tools. A clean bucket capable of holding over a gallon of water, and clean, lint-free wipe down towels. Before starting the icemaker cleaning and descaling procedure, ensure that the icemaker evaporator is completely free of ice and at room temperature. An evaporator full of ice will prevent the descaling solution from removing the scale intended by this process. The bin signal switch on the dispenser electrical box can be used to turn off the icemaker, providing time for the evaporator to thaw, while allowing the nursing staff to still dispense the stored ice in the dispenser. When ready to begin, remove the ice machine panels required to gain access to the electrical boxes and the float reservoir assembly. Remove the front panel. The CI series dispensers use pop on, pop off bayonet mounts. Turn off the ice dispenser power switch located on the dispenser electrical box. Also, turn off the compressor switch located on the icemaker electrical box. This shuts the refrigeration system off but allows the gear motor to turn the augur for the agitation of the cleaning and descaling solution. Remove the splash panel by removing the four Philips head screws securing the panel to the dispenser. Close the water inlet supply valve on the left. On the 25 and 50CI series dispensers, the water shut off valve on the right turns off the water supply to the water dispense solenoid valve, allowing removal of the splash panel, while allowing the icemaker to run. The water shut off valve on the left turns off the water supply to both solenoid valve and the float reservoir valve on the icemaker. Disconnect the waterline from the solenoid valve mounted on the panel and set the panel on the counter to the left of the dispenser. Flip the drain pan protector panel down to its horizontal position. Remove the cover from the float reservoir. Release the evaporator drain tube clamp. Remove the drain tube from the retainer on the float reservoir support bracket. Remove the plug from the end of the drain tube. Empty all of the water from the evaporator and the float reservoir. Insert the plug back into the drain tube and secure the line back into the float bracket retainer. Disconnect the ice transport tube from the ice compression nozzle by loosening the automotive type hose clamp and pulling the tube off of the nozzle. The ice maker module can be pulled out from the front of the dispenser to improve service access. If this is the first time the ice maker module is being pulled out of the dispenser, loosen and remove the securing screw and spacer from the icemaker base. It is used only for securing the icemaker during shipping and can be discarded. Remove the ice compression nozzle from the evaporator outlet by loosening the clamp, removing the Philips head screw, and sliding the nozzle out of the evaporator outlet. Mix one 7 oz. packet of Follett SafeClean ice machine cleaner and descaler with one gallon of hot 120 degree water. A Follett -approved icemaker cleaner mixed according to the manufacturer’s recommendations may be substituted. Slowly, add the cleaning and descaling solution to the float reservoir, filling both the reservoir and the evaporator until the solution is almost overflowing the reservoir. Verify that the solution is not trapped in the reservoir. If only a small amount of solution was needed to fill the reservoir, lightly tap on the side of the reservoir to break the air packet that can form at the outlet at the bottom of the reservoir, releasing the solution and allowing it to flow into the evaporator. Turn the power switch back on, leaving the compressor switch in the off position. Only the augometer will run. Allow the motor to run for 15 minutes. The auger will stir and agitate the cleaning and descaling solution in the evaporator. During that time, submerge the ice compression nozzle and drain tube in a container of the icemaker cleaning and descaling solution for 15 minutes as well. Do not use any abrasive materials to remove scale from the inside of the ice compression nozzle. While the cleaning and descaling solution is working, other maintenance procedures can be performed. The 25 and 50CI series dispensers feature a removable, cleanable air filter. It is located in the left airtight grill. Remove the securing screw at the top of the grill and remove the grill from the dispenser. After removing the filter from the grill, it can be rinsed clean with cool water and set aside to dry. On other Follett models, a Shopvac with a brush attachment is very effective in removing the dust and lint from the air-cooled condensers. This procedure should be done as often as required to keep the unit running at peak performance. Remove the scale from the evaporator drain pan and drain lines. The pan is made out of flexible plastic that can be flexed to break the scale free. Do not use abrasive materials to remove residual scale. Instead, wear on rubber gloves, wipe out the pan with a cloth dipped in the SafeClean solution. After the 15 minutes have elapsed, turn the power switch off. Using the evaporator drain line, drain the solution from the reservoir and evaporator. In some instances of heavy scale accumulation, a single application of icemaker cleaning and descaling solution may not be sufficient to completely remove all of the mineral build up from the evaporator. If heavy scale accumulation is expected, refill the evaporator with fresh cleaning and descaling solution and repeat the application a second time. All of the scale must be removed. Removing only part of the build up can lead to unnecessarily high loads on the drive system and inconsistent icemaker operation. When complete, replace the plug in the drain tube and replace the drain tube in the retainer. Refill the reservoir and the evaporator with fresh, 120 degree water until almost overflowing. Turn the power switch back on to run the auger motor for one minute to agitate the rinsing water. Turn the power switch off and drain the evaporator. Repeat this rinsing procedure two more times. Rinse the ice compression nozzle and drain tube thoroughly with fresh water. At this point the icemaker has been cleaned and descaled, but to provide high quality, sanitary ice, it must also be sanitized. Sanitizing removes undesirable and potentially harmful microbial growth from the icemaker water system. Temporarily connect the ice transport tube directly to the evaporator outlet port. Do not reinstall the ice compression nozzle at this time. Mix a solution of 1.6 oz of new Calgon IMS 2 sanitizer to one gallon of hot 120 degree water. Submerge the ice compression nozzle and drain tube in a cup of sanitizing solution. Slowly add the sanitizing solution into the float reservoir, filling both the reservoir and evaporator until the solution is almost overflowing the reservoir. Verify that the solution is not trapped in the reservoir. Turn the power switch back on, leaving the compressor switch in the off position. Allow the auger motor to run, stirring and agitating the solution in the evaporator for 10 minutes. At the end of the 10 minutes, turn the compressor switch back on. As the icemaker begins to make ice, maintain the liquid level in the float reservoir by manually adding solution to the float reservoir as needed. This ice will move through the ice transport tube to the ice storage bin, sanitizing the ice transport tube in the process. Follett recommends that the ice storage bin be cleaned and sanitized immediately following the sanitizing of the ice maker. If the storage bin will not be cleaned and sanitized immediately following this procedure, disconnect the ice transport tube from the ice storage bin and divert the ice made from the sanitizer solution to another container to be discarded. This ice should only be allowed to enter the ice storage hopper if the hopper will be cleaned and sanitized when sanitizing the icemaker is complete. Continue to make ice from the sanitizing solution for 20 minutes. Turn the power switch to the off position. Reconnect the ice transport tube to the hopper if previously disconnected. Disconnect the ice transport tube from the evaporator discharge outlet port. Rinse the ice compression nozzle and drain tube with fresh water, and reconnect to the outlet port of the evaporator. It is very important to use only Follett supplied clamps and screws to attach the ice compression nozzle to the evaporator discharge port. Screws that are too long will inhibit the flow of ice and cause the icemaker to shut down. Align the holes in the clamp, nozzle, and outlet port and insert and tighten the Philips head screw. Tighten the clamp firmly with a nut driver. Reconnect the ice transport tube to the ice compression nozzle outlet and secure with the hose clamp. Drain the sanitizing solution from the reservoir and the evaporator. Insert the drain plug and replace the drain tube in the retainer. Refill the reservoir and evaporator with fresh water until almost overflowing with 120 degree rinsing water. Turn the power switch back on to run the auger motor for one minute to agitate the rinsing water. Turn the power switch off, and drain the evaporator. Repeat this rinsing procedure two more times. Re-clamp the drain tube pinch clamp, replace the drain tube plug, and re-secure the drain tube in the float bracket retainer. Replace the reservoir cover and open the water supply valve. Ensure that the end of the drain tube is well above the water level in the reservoir to prevent accidental water leaks. Turn the power and compression water switches back on and make ice for at least fifteen minutes to flush any remaining sanitizing solution from the system. Ice makers installed separately from the dispenser in remote locations with long transport tubes may take longer to flush out the sanitizer. The icemaker is now finished! It is time to turn our attention to the dispenser. Remove and discard all ice from the ice storage hopper. Do not reuse any of this ice or put any of this ice back into the hopper after the procedure is complete. Refill the hopper with only fresh ice. Once the bin is empty, turn the power switch off. Always disconnect power before cleaning. Remove the cover from the ice storage hopper. Working inside the storage area, loosen and remove the knurled screw and remove the ice dispense wheel. Remove the ice and water dispense chutes from the dispenser. On older style dispensers, with chute covers and clear dispense chutes, remove the chute covers and remove and disassemble the ice and water dispense chutes. Older units can be field retrofitted with the newer, single piece agion impregnated dispense chutes. Agion is a naturally occurring antimicrobial material that inhibits microbial growth on treated components, such as the dispense chutes. If you would like to learn more about agion and its benefits, please contact Follett technical service or your local Follett representative. Thoroughly wipe all surfaces with a cloth soaked in the cleaning and descaling solution made with SafeClean. Simply spraying the solution onto the surfaces is not as effective. Do not use solvents, abrasive cleaners, metal scrapers, or sharp objects. The surface is to be cleaned are, the underside of the hopper lid, the rotating agitator, the baffle, the top and bottom of the dispense wheel, the inside of the storage hopper, including the ice dispense port, and the dispense chute assemblies. Thoroughness is key to a successful cleaning. Any residue left behind could lead to recontamination of the unit. Rinse all surfaces thoroughly, taking care not to allow water to run through the center hole at the bottom of the hopper. Excessive water can damage the ice dispense motor. Wipe down all of the surfaces again with a damp cloth wrung out in the sanitizing solution made with the new Calgon IMS 2 sanitizer. Reassemble and reinstall all parts without rinsing. The final treatment sanitizes the surface and keeps them sanitary and contaminant-free during reassembly. Turn the icemaker back on and check for proper operation. Clean the drain pan and grille using the cleaning solution. Rinse thoroughly. Slowly pour one gallon of hot water into the drain pan to prevent algae growth in the drain lines. Although very similar, the procedure for the 12CI series dispensers have some minor differences. The float reservoir is located on the right side of the dispenser. Remove the dispenser lid, pull out on the bottom of the top cover and lift off of the dispenser to disengage. To access the water shut off valve, remove the Philips head screws securing the splash panel to the dispenser and remove the splash panel. To remove the top cover on older 12CI model dispensers, loosen the two Philips head screws at the top of the splash panel and lift off the front cover. To remove the splash panel, remove the four Philips head screws. Pull the bottom of the panel out and disengage the panel at the support at the top. When replacing the panel, be sure that the top panel is engaged behind the support bracket to ensure that any water drippage runs down the front of the panel. The lid of the ice storage hopper is secured to the hopper by 3 knurled screws. Removing the lid opens a safety switch, cutting power to the dispense motor. To remove the ice dispense wheel, the baffle above the dispense opening must be removed from the ice storage hopper. Remove the center thumb screw and locking plate. Loosen and remove the two wingnuts and backing plate. Remove the threaded rod and rotating agitator, remove the baffle and ice dispense wheel. Clean and sanitize all components as described earlier on the 25CI dispenser. When complete, reinstall the dispense wheel. Insert the stainless steel baffle and secure with the bracket and wingnuts. Install the retaining bracket with a knurled screw to prevent the wingnuts from loosening. Install the rotating agitator and secure with the knurled screw. Be sure to re-secure the lid with the three knurled screws. Dispensers and icemakers require cleaning, descaling, and sanitizing at least every six months, and more often if local or environmental conditions dictate. Failure to clean the icemaker and dispenser can result in unsatisfactory performance and potential equipment damage. Proper preventive maintenance is the surest way to assure reliable, satisfactory equipment performance and a consistent supply of fresh, sanitary ice. 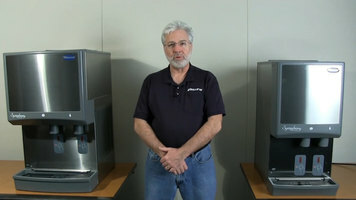 At Follett, we are pleased to have produced this video demonstrating the correct procedures for cleaning, descaling, and sanitizing Follett Symphony ice and water dispensers. If, after viewing the video, you have questions, please feel free to contact our technical service department at 877-612-5086. You may also want to attend one of our complimentary technical service seminars at a location near you. For information related to our training seminar schedule, please visit our website at www.follettice.com and click on the tab identified as training. Please remember that all icemakers and ice dispensers require periodic cleaning and sanitizing. Follett’s innovative designs are intended to make this procedure fast and easy. Maintenance procedures should be performed on a semi-annual basis, but more often if local water or environmental conditions require it. Regular cleaning and sanitizing is the only way to ensure reliable equipment performance and the production of clean, sanitary ice. Follett is committed to manufacturing high quality, high value equipment and providing exceptional customer service. We hope that you have found this video to be helpful in fulfilling that goal. Thank you for your time, your attention, and your interest in Follett products. To ensure that you are providing customers with the most sanitary products possible, follow these guidelines on how to properly clean and sanitize your Follett Symphony water and ice dispenser. Bin Storage Capacity 50 lb. 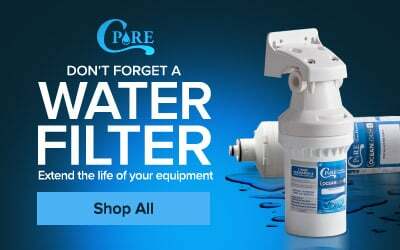 Why is a water filter important? A water filter is a worthwhile investment to make because it will have a huge impact on the long-term performance of your new ice machine. 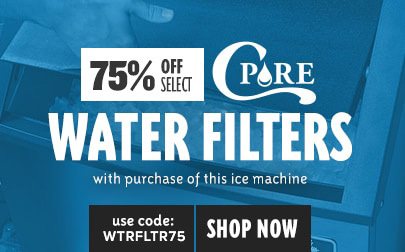 A filter is essential to prevent the build-up of mineral deposits and sediments within the ice machine. 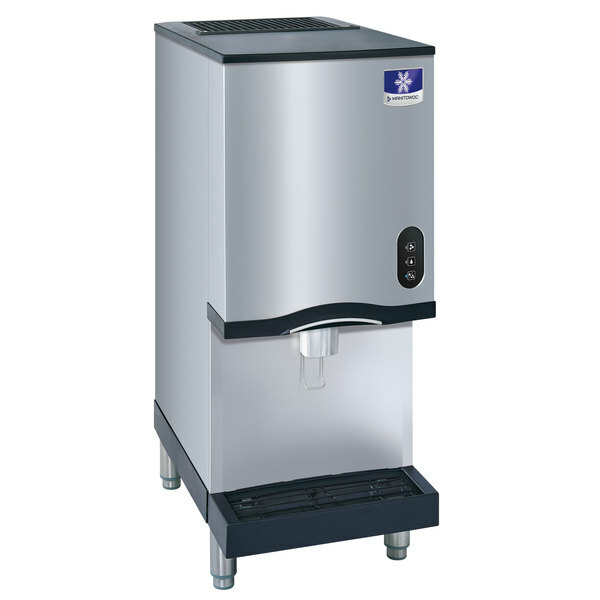 This Follett 50CI425A-L Symphony countertop air cooled ice maker and water dispenser is the perfect solution to ice and water dispensing in your healthcare facility, retirement community, or restaurant! Its ice maker produces up to 450 lb. of soft, chewable Chewblet compressed nugget ice per day. This type of ice is often preferred over cubes for its ability to conform when used in ice packs! It is also chewable and perfect for filling cups and pitchers. This ice maker and dispenser is designed for optimum sanitation. 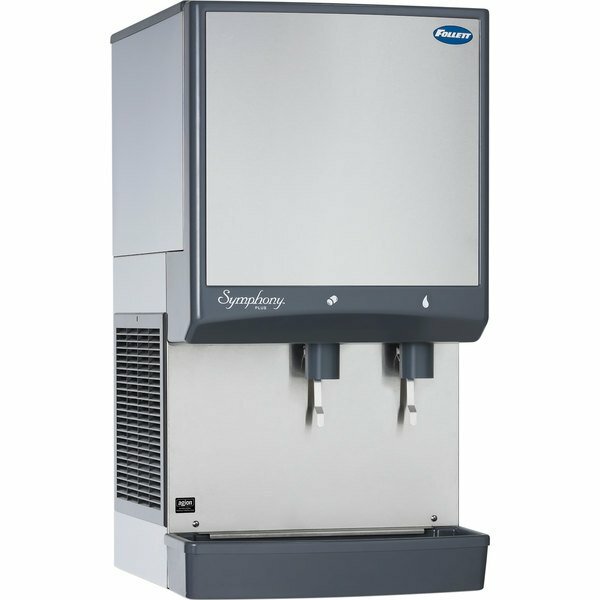 The automatic self-flushing feature removes more impurities so that you are a left with cleaner, better flavored ice. Add in the drain cup that helps provide an air gap for added protection of the food zone components and you have an ice machine that keeps itself free of contaminants. Agion silver-based antimicrobial technology also provides protection of many important components that come into contact with ice and water. For easy operation, this ice machine features a one-handed lever dispensing operation. Simply push the cup, carafe, or pitcher against the lever for a fresh supply of ice. Looking for an environmentally responsible unit? Look no further. This Follett ice machine and dispenser uses R-404A refrigerant that has a zero ozone depletion potential and its continuous ice making process uses less electricity and water. Plus, this unit features Quiet Night sleep mode to automatically turn off the machine when it is idle. This unit uses 12 gallons of potable water per 100 lb. of ice and has a storage capacity of 50 lb. This Follett ice maker and dispenser features an easy, quick cleaning cycle and the LED control board provides instant access to the machine status and settings. The durable stainless steel panels are easy to remove in order to perform maintenance on the machine, and the other components like the poly drain pan, grille, and dispenser lid are corrosion-resistant so that you can count on them for a long time to come. 120V. Follett 50CI425A-S Symphony Countertop Air Cooled Ice Maker and Water Dispenser - 50 lb. Follett 50CI425A-LI Symphony Countertop Air Cooled Ice Maker / Dispenser - 50 lb. Follett 50CI425A-SI Symphony Countertop Air Cooled Ice Maker / Dispenser - 50 lb. Follett 50CI425W-S Symphony Countertop Water Cooled Ice Maker and Water Dispenser - 50 lb. Follett 50CI425W-L Symphony Countertop Water Cooled Ice Maker and Water Dispenser - 50 lb. Follett 50CI425W-LI Symphony Countertop Water Cooled Ice Maker / Dispenser - 50 lb. Follett 50CI425W-SI Symphony Countertop Water Cooled Ice Maker / Dispenser - 50 lb. Save $1,070.00 with our Recommended Product! Check out this Manitowoc air cooled countertop ice maker and water dispenser instead! Featuring lever dispensing with blue LED lighting and convenient, space-saving design, this item is a great alternative at a much lower price! Bin Storage Capacity 20 lb.